What is a four-star restaurant in 2017? We’re going to talk about that, but first we need to eat, because the dishes are coming to the table as they’re ready, fast and hot. 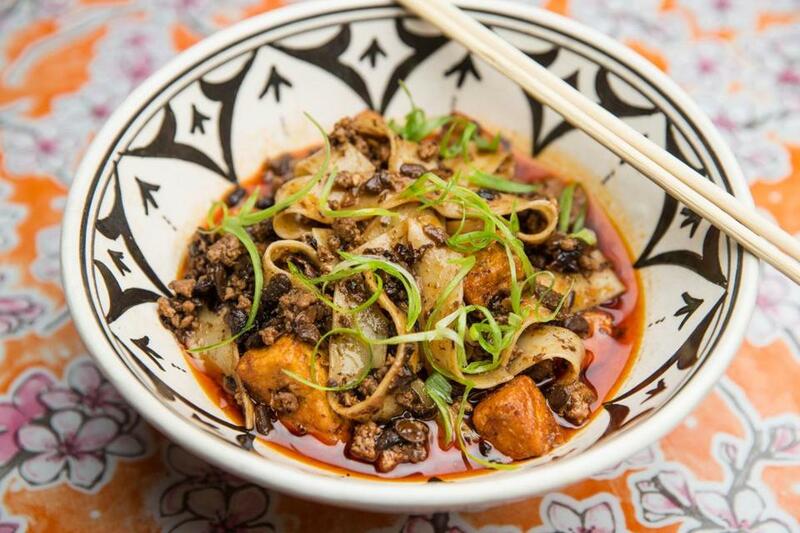 That’s the way Myers + Chang does it, has done it now for 10 years, corralling the flavors of Taiwan, Southeast Asia, and beyond onto shareable plates — great when it opened, great today, great just about every day in between. If you don’t know how hard a feat that is to achieve, you don’t eat in a lot of restaurants. We should get the tiger’s tears. It has long been one of my favorite dishes in the city: simple, incendiary. Bites of grilled steak are tossed with plenty of herbs, sliced bell peppers, and a bright, fierce dressing, then showered with khao koor, the toasted rice powder that adds nuttiness and grit. Also the green papaya salad, shreds of unripe fruit tangled with peanuts, mint, and chiles, dripping fish sauce-scented dressing. It was a different century when Laotian foremothers first picked up mortar and pestle to bludgeon this dish into cohesion, but they displayed the awareness of modern perfumers, threading lines of funk through the freshness. Then there are the crispy spring rolls. I order them in part because they poke a very specific set of neurons for me: Bite into one and I’m transported to the Chinese restaurant closest to the tiny Midwestern college I attended in the early 1990s, which is to say an hour’s drive away. It was located inside a two-story house with crooked floors, celery standing in for the majority of Asian vegetables, and it is long since closed. These were the exact spring rolls they served. But you don’t have to feel all Proustian about them; everybody likes these rolls, which taste like an American notion of Chinese food that is both dated and comforting. Their contrasts make them irresistible: the papery crunch of the skins giving way to springy glass noodles inside, the hot-from-the-fryer exterior against the cool, sweet duck sauce you’ve swiped them through before biting in too soon — ill advised, but it’s hard to wait. I burn my mouth every time. 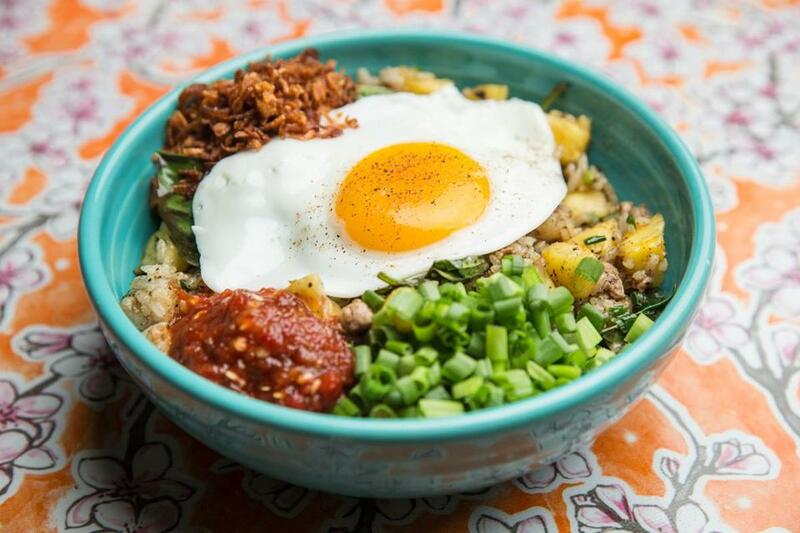 Nasi goreng is the dish I ate in hopes of inducing labor when my son refused to depart the premises; the spicy fried rice has reportedly jump-started things for other pregnant women. I stirred together the grains with the curled-up, just-cooked shrimp, the salty pork and sweet pineapple, the runny egg, the loose red pool of sambal oelek chile paste, and asked for deliverance. I had a C-section a few days later. The memory of Myers + Chang’s nasi goreng sustained me as I ate bland hospital food and remembered sleep. “But this is so personal,” you’re thinking. “That’s not how reviews work.” And it’s not: I don’t evaluate restaurants for me, I evaluate them for all of us. Yet it’s Myers + Chang’s extended presence, the opportunity it has offered us to become a real and personal part of our lives, that makes it more than just good. It may not be an “important” restaurant, but it is a meaningful one. You might come here after an event, still dressed in black tie. You might come here after a show, ancient concert T all sweaty. You might come here with friends, you might bring your family, you might be a local celebrity, you might be a college student. We’re all going to eat Mama Chang’s dumplings and lamb biang biang noodles. We’re all going to sit where we can be seated, on a tall pink plastic chair beside the woks spitting flames, crowded at a high-top, along the dragon-festooned window with a view of the bus stop, or at an enviable table, for those who timed things right or remembered to make a reservation. (For that matter, we’re all going to use the same restrooms, doors marked with the Prince symbol.) There are no tablecloths. Utensils are stored in empty tea tins: Help yourself. The restaurant looks like a diner crossed with a modular home then possessed by the spirit of Hello Kitty. It is always crowded. Tell people you’re coming here for dinner and they say, “I love that place!” It makes people happy. I need that right now. Don’t you need that right now? 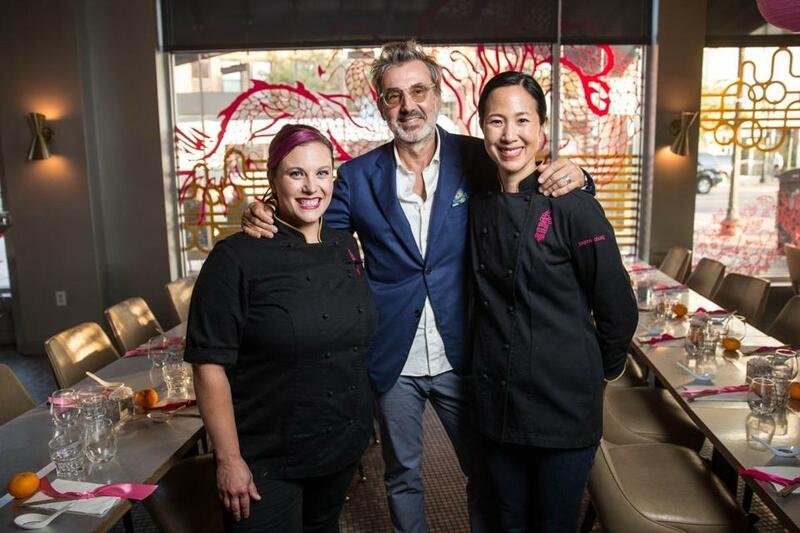 Over the past decade, in the hands of chef-owner Joanne Chang and executive chef Karen Akunowicz, the restaurant has managed to evolve while remaining the same in the right places. (The Myers is Christopher, co-owner and Chang’s husband.) 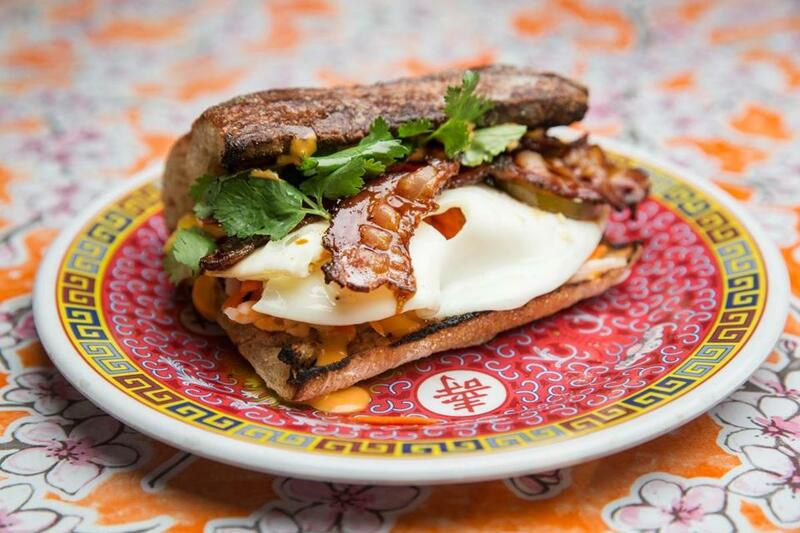 Here, still, are the classic dishes we can’t do without: cold Taiwanese dan dan noodles, Hakka eggplant, pan-roasted soy-glazed salmon, that fried egg banh mi with bacon I wish were available outside of brunch. Yet new favorites keep appearing: tuna poke with crispy wheat berries; Korean bokkeumbap made with quinoa, barbecue beef, kimchi, and pistachios; a take on grilled street corn; a sundae that involves green tea ice cream, nut brittle, whipped cream, and a squiggle of spicy ganache. The menu embraces trends but never feels like it’s merely jumping on the bandwagon. Now you can also make many of the dishes yourself. A cookbook, “Myers + Chang At Home,” came out last month; it generously includes recipes for all of the favorites. Left to right: Karen Akunowicz, Christopher Myers, and Joanne Chang at Myers + Chang in Boston. Myers + Chang is not perfect. The cocktails can be kind of terrible. If Chang or Akunowicz isn’t in the house, the center does not always hold. There’s nothing like a greasy, flavor-lacking stir-fry to make you realize how much stir-fry is an art. 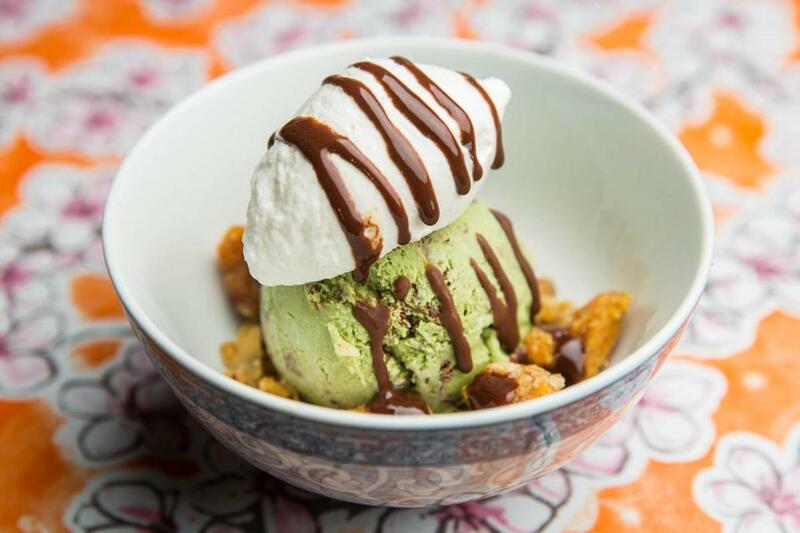 On the other hand, dessert is kind of great, which shouldn’t be a surprise — Chang is the force behind Flour Bakery + Cafe — but also isn’t a given. Without fanfare or fuss, Myers + Chang introduced menus free of meat, gluten, shellfish, and nuts so that everyone might eat here; if you’re chilly, servers will offer you a pashmina or some tea. When it comes to restaurants, we are in a post-perfect era. I’m sure we’ll want it again, that polish, that artifice, that precision and finesse. Maybe in about five hot minutes. But these days, joy, passion, a strong sense of place, a commitment to caring for customers, and a high level of consistency — these are the kinds of things that conspire to make a four-star restaurant in 2017. Myers + Chang has all that, and dim sum. 1145 Washington St., South End, Boston, 617-542-5200, www.myersandchang.com. All major credit cards accepted. Wheelchair accessible. Hours Sun-Thu 11:30 a.m.-10 p.m., Fri-Sat 11:30 a.m.-11 p.m. Noise level Wok sizzle; loud laughter; intimate access to the conversations of people sitting 6 inches away from you, even as the music somehow drowns out what your own friends are saying. What to order Green papaya salad, tiger’s tears, cold Taiwanese dan dan noodles, crispy spring rolls, Hakka eggplant, nasi goreng, kimchi quinoa bokkeumbap, ice cream sundae.